Thailand, otherwise called the Land of Smiles, is a gem of Southeast Asia. Sufficiently grown to give most solaces yet still sufficiently wild to offer out of the way enterprise, Thailand is a nation ready with open door for rare travel encounters. Regardless of whether you begin with the world-class shorelines in the south or the mountain towns in the north, Thailand won’t baffle. 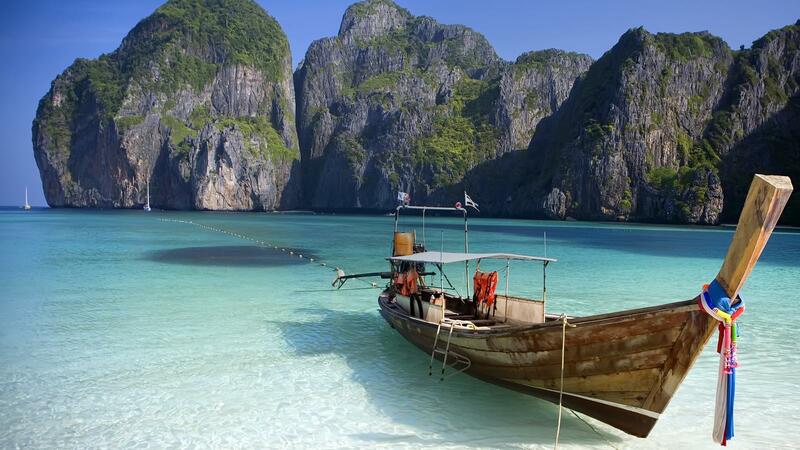 The Phi Phi Islands, also in Krabi, are one of Thailand’s most popular resort areas for a reason. Only Phi Phi Don is inhabited, with day trips available to the surrounding islands. One of the fun spots on Koh Phi Phi is Monkey Beach, where you’ll come face-to-face, literally, with the namesake creatures. You can hire a guide to take you out on a small wooden boat or rent your own kayak. There’s also a small stand where you can buy snacks and fruit shakes, but hang onto your treats. If you leave them unguarded, the monkeys will brazenly dig in and chow down right in front of you. Long Beach is another nice spot on the island; it’s not a secluded place, but is great for watching the sunset. If you’re lucky and the tide is out, it’s a beautiful walk back toward the main part of the island. Thailand’s reputation as a country of beautiful landscapes and friendly people is thanks largely to the world-renowned southern beaches. Most people don’t realize that the vast north is also home to breathtaking landscapes, though these are of a different nature entirely. Northern Thailand, particularly the western region near the Burmese border, is marked by mountainous jungle terrain that is both rugged and beautiful. Pai, in Mae Hong Son province, is a perfect place from which to enjoy the country’s natural beauty as well as the famed Thai hospitality and cooking. This small town has developed a reputation as a mecca for hippies and backpackers, though you will see locals and families here as well. There is a small nightly walking street market, a variety of local and Western foods, and easy access to nearby temples, waterfalls, and the impressive Pai canyon. Every Thailand visitor looks forward to cheap and delicious food, and it can be found in abundance at Chiang Mai’s Sunday Night Walking Street. Vendors sell all kinds of treats: pad Thai, chicken satay, samosas, crab cakes, fried bananas, sweet rotees, and fresh fruit shakes – often for less than $2 a piece. When you’ve satisfied your culinary cravings, you can peruse hundreds of stalls selling an array of unique goods such as all-natural soaps, hand-dyed textiles bearing the unique patterns of local hill tribes, incense and essential oils, musical instruments, paintings, wall hangings, and more. The market gets crowded every week without fail, no matter what time of year you’re visiting, so brace yourself and try to enjoy being part of the throng. This is a must-do in Chiang Mai, and is an essential part of the Thailand experience. If you’re not around for the Sunday market, or just want to get a taste of other market experiences in Chiang Mai, check out the Saturday Night Walking Street or the Night Bazaar on Chang Klan Road, a daily event. For something less touristy, check out the daytime Warorot Market, near Mae Ping River. Even if your plans for Thailand mainly involve frolicking on a beach, cozying up to elephants, and eating as much Massaman curry and tom ka gai as humanly possible, you’ll probably spend at least a day or two in Bangkok. There’s plenty to see and do in the capital, but it’s perhaps best to start with the Grand Palace. This is the number one sightseeing attraction in the city, and it’s staggering in historical significance and craftsmanship. The grounds are a maze of royal halls, temples, and ancient relics, the most important being Wat Phra Kaeo, Temple of the Emerald Buddha. A relic within this temple is said to be a piece of bone or hair from the enlightened Buddha himself. Allow several hours to do the Grand Palace justice, but if you’re up for more walking afterward, you can easily take in some of the city’s other major landmarks.